You are browsing the 1989 folder. John Sculley, “attired in faded, wrinkled corduroys and an Apple sweat shirt,” introduced the SE/30 and IIx: two new machines based on Motorola’s 68030 CPU. Sculley also showed off a Mac controlling a Videodisc player through a HyperCard stack, a project dubbed HyperTV. This demo paired an 8Mb IIx with video capture and NTSC-RGB conversion cards from AST, all controlling a Pioneer videodisc player via HyperTV XCMDs (external commands). 1) Communication devices (modems and networking, presumably?). 2) Color printers for “hard copy output”. 4) Accelerator cards for the Mac, “believe it or not”. This was presumably one of the first time such cards *could* be developed. Two prerequisites had been met: first, the debut of the “Open Mac” architecture of the Macintosh II a few years previously (March 1987), and secondly a processor advancement (from the 68020 that shipped in the II, to the 68030 in the IIx and SE/30.) Of course, previous closed Macs such as the Plus could be upgraded with special clip-on chips which boosted clock speeds, but 1989 was the first year that accelerators could be introduced based on the Apple-approved NuBus boards. 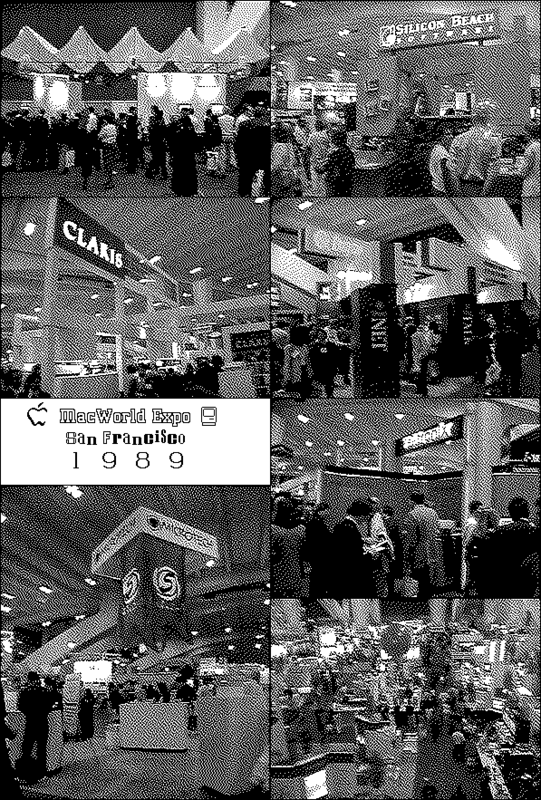 Moscone was filled with huger over-designed super booths…. Brooks Hall had more of the flavor of the early MacWorld Expos, “old fashioned and friendlier” were often heard comparisons. There were lots of interesting startup companies there too, with more bucks spent on the product, than the packaging. This comparison echoes the descriptions of “TinyTown” in more recent MacWorld Expos, a term invented by Merlin Mann for the micro-booths at one end of the show floor, usually populated small/indie Mac developers. 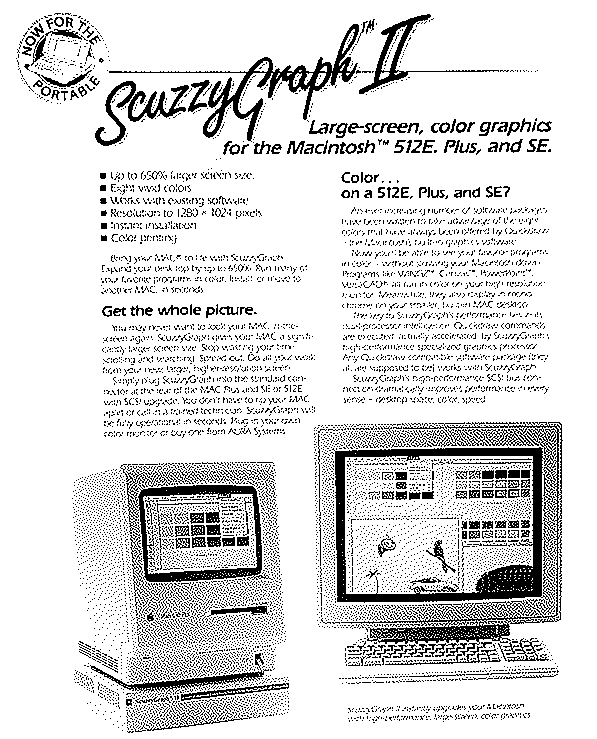 68030-based Macs made their debut with the Macintosh SE/30. Both Macworld editor Borrell, as well as BMUG observer David Morgenstern, called out the Ricoh erasable magneto-optical drives on the show floor as a hardware breakthrough. This was early 1989, and the NeXT Cube, with its standard MO drive, was surely on everyone’s mind. The idea that the Mac could keep up with the best new hardware imagined by Steve Jobs was surely comforting to folks invested in the Mac ecosystem — and hardware manufacturers such as Ricoh no doubt appreciated the large, DTP-production-oriented audience. that the Mac market represented. Another hardware breakthrough was the debut of True Color scanners — that is to say, 24-bit replacing previous 8-bit technology. “The silly scan-for-each-color contraptions are gone,” wrote Morgenstern, although the cost for these new devices was high: about $6,000. Indeed, I remember using a three-pass scanner as late as the early 90s, so it may have taken these new products a while to filter down to ordinary consumers. Dayna Communications was showing off DaynaNet, an early implementation of Novell NetWare which required a PC server with an accelerator card to run a variant of AppleTalk called DaynaTalk. The products attracted the attention of Computer Currents, which featured Stewart Cheifet reporting from their booth, but BMUG’s David Morgenstern griped about the “vaporware” status of the solution. Indeed, the product wouldn’t ship until August of 1989, eight months after the Expo. Olduvai was showing off MultiClip, a kind of multiple-pasteboard Scrapbook/Clipboard replacement. This software was very useful for Desktop Publishing, especially in the days before MultiFinder. Is going to MacWorld really worth the time, energy, and money? I don’t know, but I, for one, sure had fun. MacWorld is an extravaganza, and every year it gets larger and glitzier. I don’t know whether that’s good or bad, but if you’ve never gone to one, you really should, at least once, preferably before they have to hold it in Candlestick Park.